During the Milan Highlights Bike tour, we will show you the most beautiful places of the Nord Italian city in about 3,5 hours. Besides the must-see highlights the experienced guide shows you also the less famous sights and secret places of the city. The guide will tell you all the special stories behind this fashion city! From composer Verdi and Leonardo da Vinci through Alfa Romeo and Pirelli and of course the famous Silvio Berlusconi. This Milan bike tour is the best way to start your citytrip! 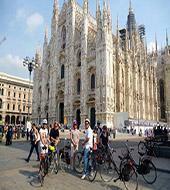 Milano is most known as fashion and business city, this is something you will see during this popular bike tour. But the city has much more to offer thanks to the mix of history, culture and the new urban developments . Milan is a city for all kind of tourists. The city has invest a lot in the bicycle services and they are improved a lot the recent years. There are several cycle paths and you will find streets that are only accessible for cyclers and walkers. In short: cycling in Milan is fun and safe!